We are monitoring the terrible news out of Lawrence, Andover and North Andover, where a series of gas explosions killed a young man, injured at least two dozen other people, and ignited 60-80 fires in those three communities north of Boston on Thursday. This has forced entire neighborhoods to evacuate as crews worked to fight the flames and shut off the gas. The Archdiocese of Boston has several parishes, schools and ministries in the impacted areas and we are in close contact with Bishop Robert Hennessey, Regional Bishop for the Merrimack Region, pastors, principals and staff. Our first concern is the safety of all the people of the region. We also need to maintain our social service ministry, and entities such as Catholic Charities, Cor Unum food pantry and other agencies are hard at work to continue to serve anyone in need. We ask that residents and parishioners follow the direction of local officials in order to ensure their safety. If you are unsure, ask a first responder, reach out to your parish priest or school principal. Please join us in expressing our great gratitude to the first responders, federal, state and local officials who are proceeding with determination and care for the communities impacted. Offer them some water, nourishment and your cooperation so that they can lead us out of this crisis. St. Michael the Archangel, keep watch over our first responders and the wonderful people of the Merrimack Region during this difficult time. As I mentioned in my preface to last week’s blog, this week and last, I have been in Rome for meetings related to the work of the Pontifical Commission for the Protection of Minors and the C9 Council of Cardinals. Last week, much of my time was dedicated to the work of the Pontifical Commission for the Protection of Minors. The Holy Father has emphasized the primary importance of listening to victims /survivors and having their life stories guide the response of the Church in protecting minors from sexual abuse. Members began by listening to two testimonies of people who were affected by clerical child sexual abuse, a victim/survivor and the mother of two adult survivors who were abused as children. The Commission thanks them for sharing their stories with us, for the courage of their witness and for contributing to the learning process. Members also reflected on the recent developments in the global church that have negatively affected so many people including victims/survivors, families and the community of faithful. The questions that have been raised in recent months not only focus the public on the seriousness of abuse, they are an opportunity to call people to the mission of prevention so that the future will be different from our history. The Commission’s starting point is not to investigate abuses; our starting point is to prevent abuses. During the Plenary Assembly the group of experts dedicated to Working with Survivors announced the launch of pilot projects, the first of which is in Brazil. Building on the work of founding members, these projects are a mechanism to create safe spaces and transparent processes by which people who have been abused can come forward. Through these survivor advisory panels it is hoped the local church leadership will also benefit from the direct input of victims/survivors into how they can improve their child protection and safeguarding policies. Since meeting in April, Commission members have taken part in over 100 safeguarding workshops. The group that oversees Education and Formation outlined a series of future initiatives in formation seminars and conferences that are an essential part of promoting awareness of and responsibility for protection policies at a local level. In April 2019, the Commission will sponsor a Safeguarding Conference for Church leaders in Central/Eastern Europe. Also in April 2019, together with the Brazilian Bishops Conference the Commission will offer a week of safeguarding formation for bishops and formators, in Aparecida, Brazil. In November 2019 Members have been invited to address a meeting of CELAM in Mexico. In 2020, the Commission will co-sponsor a Congress on Protection of Minors for operators in the church and civil society in the Americas in Bogotá, Colombia. The working group Safeguarding Guidelines and Norms shared its progress on developing an auditing instrument to offer to local Bishops Conferences to aid in the oversight of their safeguarding policies and procedures. Collaboration with the entities of the Holy See and Roman Curia is also an integral part of the Commission’s mandate to aid the Holy Father. During the Plenary, some members had the opportunity to address the two courses for bishops newly ordained the in the past year, one organized by the Congregation for the Evangelization of Peoples and another by the Congregation for Bishops. 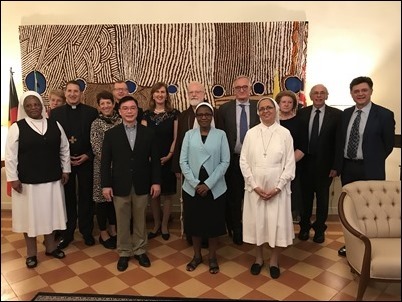 The Commission presentation was well attended and warmly received and members are grateful to the Prefects of these Congregations, Cardinal Filoni and Cardinal Ouellet and their collaborators for those meetings and the consistent attention to this important aspect of our safeguarding mission. Over the course of the coming week the Commission will also have working meetings with the Congregation for the Doctrine of the Faith and with the Italian Bishops Conference CEI, to further collaborative efforts in the field of child protection. We also had contact with the Vatican ambassadors of Ireland, Chile, and Australia. We always work closely with these three countries because of the situations there. Following our session, I also conducted an interview with Vatican Radio which I would like to share with you here. The interview came at the invitation of the new head of Vatican Communications, Dr. Paolo Ruffini. Last Saturday, I gave a conference to the group of about 200 bishops from around the world who have been ordained in the past year. 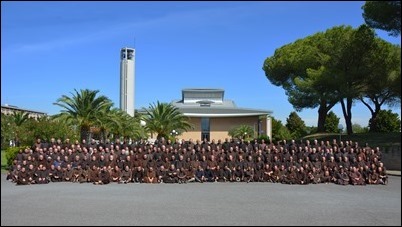 They were in Rome for the two-week seminar given annually to all recently ordained bishops to help prepare them for their new ministry. Each year, a group of us from the Pontifical Commission for the Protection of Minors addresses this group on child protection issues and, this year, I was accompanied by Dr. Myriam Wijlens and Father Hans Zollner. Also, though Marie Collins was not available to be present in person, she prepared a beautiful video that we presented to the bishops. Giving our Church’s leadership the opportunity to hear directly from victims and survivors is a very important way of helping them to understand their pastoral responsibilities and the urgency of providing pastoral care to survivors and creating safe environments. The Council of Cardinals, in the first meeting of its twenty-sixth session, in which it prepares to submit to the Holy Father its proposal on the reform of the Roman Curia drawn up in its first five years of activity, and in view of its continuation, has decided to ask the Pope to reflect on the work, structure and composition of the Council itself, also taking into account the advanced age of some of the members. 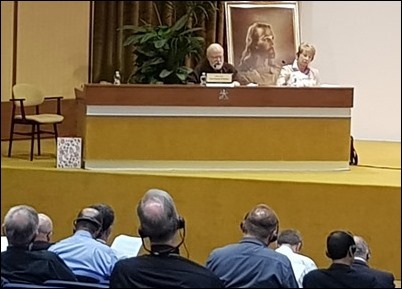 The Council expressed its satisfaction for the good outcome of the Ninth World Meeting of Families in Dublin, congratulating Cardinal Kevin J. Farrell and the Dicastery for the Laity, Family and Life, which along with Archbishop Diarmuid Martin, organized the event. It expressed its full solidarity with Pope Francis with regard to the events of recent weeks, aware that in the current debate the Holy See is about to make the eventual and necessary clarifications. As usual, our meetings concluded on Wednesday. One of the important outcomes was the Holy Father’s call for a meeting next February of the presidents of all the bishops’ conferences throughout the world to discuss the safeguarding of children. I know the Pontifical Commission for the Protection of Minors will be very much involved in helping to prepare for that, and we think it will be an opportunity to raise consciousness and to give the kind of help needed to many countries where this issue is just beginning to be dealt with. We also hope to have the opportunity to hear the voice of victims hurt by the leadership of the Church. 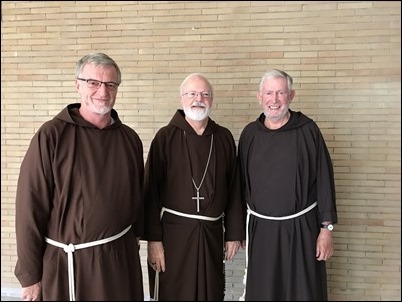 My time in Rome happened to coincide with the 85th General Chapter of the Capuchins, which was also taking place in Rome at the Collegio San Lorenzo da Brindisi. Every six years, we have this gathering of representatives from all the provinces throughout the world who come together to elect new leadership. Our new Minister General is Father Roberto Genuin, who was the provincial of Venice, and is replacing Father Mauro Jöhri from Switzerland. Our new Vicar General is a friar from my province who was previously the Custos of Puerto Rico, Brother José Ángel Torres Rivera. Also elected to the general council was Brother Celestino Arias (known affectionately as Brother Tino), whom many in Boston will remember from his work at St. Peter’s Teen Center in Dorchester. Because of his new position, he will now be living in Rome. Finally, on Thursday, I was asked to accompany the delegation of the leadership of the U.S. Conference of Catholic Bishops in their meeting with the Holy Father to discuss the situation in the United States in light of recent developments. The delegation included USCCB President Cardinal Daniel DiNardo, Vice President Archbishop José Gomez, and Secretary-General Msgr. Brian Bransfield. 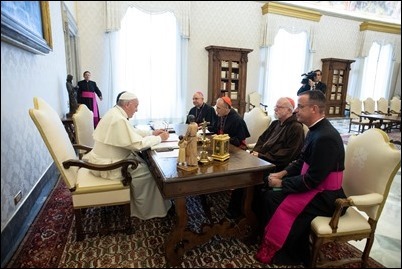 We had about an hour meeting with the Holy Father, during which the Holy Father impressed upon us how close he feels to the Church in the United States in this time of great difficulty, and we talked about various paths forward. We concluded our meeting praying that the Lord help and guide us as we work to heal the many wounds in our Church.